Mean Girls, a sensational movie that leaves its audience in hysterics while accurately depicting the struggles of high school, was released 13 years ago. This year, the iconic movie was turned into a Broadway hit musical. 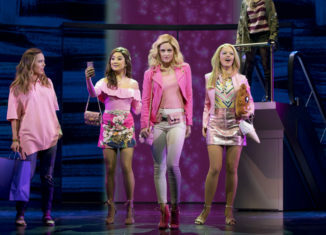 Mean Girls Broadway has been reinvented into a modern-day version of the movie, with show-stopping musical numbers. As a huge fan of the movie, I immediately got tickets for Mean Girls Broadway. The show lived up to my high expectations, and I was blown away by the outstanding remake of the plot and superb musical performances. Mean Girls depicts a high school teenager, Cady Haron, who transitions from a homeschooled girl from Africa to a public high schooler in the United States. Cady is excited to finally obtain the social life she always desired, but she doesn’t realize the challenges she is about to face. Quickly, Cady learns that high school is filled with judgment and cliques. She struggles to find her place, but two students, Janice and Damien, take her under their wing. The three most popular girls in school, Regina, Gretchen, and Karen, are known as the Plastics, or “teen royalty.” Regina is the queen bee and decides to make Cady a member of the Plastics. Cady, upset by the social hierarchy of high school, plans to take Regina down with Damien and Janice. The Plastics belittle everyone in a burn book, writing down rude remarks about all of the students. Cady loses herself as she becomes so caught up with replacing Regina and being popular. Cady quickly goes from an animal loving, calculus-excelling teenager to a bad friend and a clone of Regina. The plot is meant to teach its audience to always be true to yourself and that bringing down others won’t make you feel any better about yourself. From their mannerisms to their looks and even their voices, each character in the show accurately resembled the characters from the movie. The plot also mostly followed the movie, with some new and exciting changes. The props, dance moves, and scenery were truly one of a kind. This 2004 movie was modernized into a 2018 version of high school, with updated catchphrases and a heavy emphasis on how the use of social media affects high school students. If you are looking for an inside glimpse of the show, check out @meangirlsbway on Instagram or make sure to download the song “I’d Rather Be Me” on iTunes, which was recently performed on The Tonight Show Starring Jimmy Fallon by Barret Wilbert Weed, who plays Janice. I would definitely recommend this show to anyone who is a fan of the movie, is looking for a good laugh, or always enjoys a sensational Broadway show. The characters, plot, musical numbers, and main message truly make the show unique.